Sometimes, inspiration just strikes — usually on a sunny San Diego day after some medicine and a few brewskis — and the advantage of new technology is the ability to easily just hit the record button and go for it. 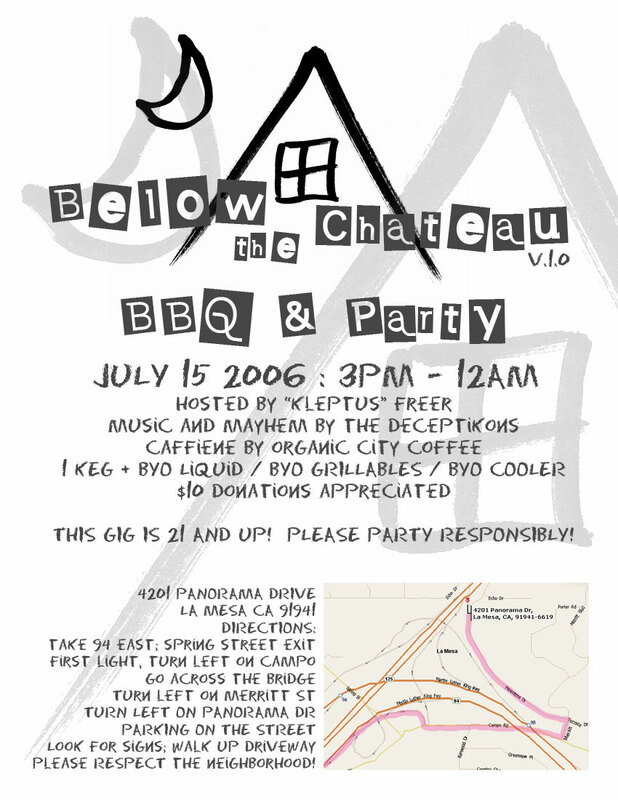 A few years back, he set up an outdoor DJ station on the Panorama property, and fueled by a cooler full of Tecate, laid down a number of creative mixes to pay tribute to the land of the notorious Below the Chateau shindig. This summer of 2008 mixapalooza generated some interesting soundscapes that wandered widely into not-so-normal musical genres. Starting out with some Danny Elfman “Theme from Beetlejuice” was an extraordinarily difficult yet rewarding cannonball into the deep end for mixing through a series of recognizable rock pieces. Some fun with hot summer jams. DJ Lurk luuuuuurves those Hybrid boys and their inimitable swoop synths, crushing breakbeats, and deep tonal bass. Inspired by and including lots of remixes. An attempt at ridiculously fast electronica with mixed results, pun intended. Two mixes in one day is unheard of, but apparently accomplished.